Piperlongumine (PLM) is a natural product from the pods of a plant call Piper longum and was reported to possess antibacterial, antiangiogenic, neuroprotective, anti-inflammatory and anti-tumor activities. However, the role of PLM in inflammatory responses in human Osteoarthritis (OA) chondrocytes has not been yet explored. Thus, in this study, we investigated the anti-inflammatory action of PLM in human OA chondrocytes. Our results demonstrated that PLM treatment effectively reversed IL-1β-inhibited cell viability in a dose-dependent manner. In addition, PLM significantly inhibited the production of NO and PGE2, iNOS and COX-2 expression, as well as suppressed the production of MMP-3 and MMP-13 in IL-1β-stimulated human OA chondrocytes. Furthermore, PLM significantly prevented IL-1β-induced NF-κB activation in human OA chondrocytes. In conclusion, these findings demonstrated that PLM attenuated inflammatory responses in human OA chondrocytes stimulated by IL-1β, possibly through the NF-κB signaling pathway. Thus, PLM may serve as a potential anti-inflammatory agent in the treatment of OA. Osteoarthritis (OA), Piperlongumine (PLM), Chondrocytes, IL-1β. Osteoarthritis (OA) is a progressive degenerative disease characterized by cartilage destruction, subchondral bone remodeling, osteophyte formation and synovial inflammation . The prevalence of OA increases dramatically in people over the age of 50. Nonsteroidal Anti-Inflammatory Drugs (NSAIDs) are the primary treatment for OA; however, their side-effects have become an object of concern [2,3]. Thus, efforts are urgently needed to investigate safer and better tolerated agents for the treatment of OA. The inflammatory cytokine Interleukin 1β (IL-1β) plays a key function in the pathogenesis of OA. It can induce inflammatory mediators and matrix Metalloproteinases (MMPs) in chondrocytes, leading to disruption of the balance between biosynthesis and disrupting of the Extracellular Matrix (ECM) [4,5]. Thus, it is believed that disturbing pro-inflammatory cytokine activity may be a good therapeutic approach for treating OA. Piper longum L. is used in traditional medicine in Asia and the Pacific Islands. Piperlongumine (PLM) is a natural product from the pods of a plant call Piper longum. A growing body of evidence indicates that PLM possesses antibacterial, antiangiogenic, neuroprotective, anti-inflammatory and antitumor activities [6-9]. For example, Gu et al. reported that PLM significantly suppressed immune cells infiltration, astrocytes/microglials activation, production of inflammatory cytokines in RAW 264.7 and Jurkat cells . In addition, a study by Xiao et al. reported that PLM treatment improved the severity of arthritis and decreased ROS production in a rheumatoid arthritis mouse model . However, the role of PLM in inflammatory responses in human OA chondrocytes is still unclear. Thus, in this study, we investigated the antiinflammatory action of PLM in human OA chondrocytes. Upon approval from the Ethics Committee of Union Hospital and after obtaining written informed consents, human OA cartilage was obtained from four females (mean ± SD age: 65.3 ± 3.2 y), undergoing total knee arthroplasty. Human articular cartilage was cut into small pieces and digested with 0.3% collagenase type II (Invitrogen, Carlsbad, CA, USA) for 4 h at 37°C in a shaker. Then, cells were cultured in Dulbecco’s modified Eagle’s medium (DMEM; Gibco, Grand Island, NY, USA) supplemented with 10% Fetal Bovine Serum (FBS; Takara Biotechnology, Dalian, China), penicillin (100 IU/ml; Sigma, St. Louis, MO, USA), streptomycin (100 μg/ml; Sigma) at 37°C in a humidified atmosphere containing 5% CO2. Human chondrocytes (1 × 105 cells/well) were pretreated with or without various concentrations (12.5, 25 and 50 μg/ml) of PLM (Sigma; dissolved in DMSO) for 2 h and then incubated with 10 ng/ml IL-1β for 24 h.
Cell viability was assessed using the Cell Counting Kit-8 (CCK-8; Dojindo, Kumamoto, Japan) assay according to the manufacturer’s instructions. Briefly, after treatment, chondrocytes (1 × 104 cells/well) were plated into 96-well plates. Following culture for 24 h, 10 μl CCK-8 solution was added into each well and incubated at 37°C. After 3 h, the spectrophotometric absorbance was measured by an ELISA reader (Bio-Rad, Hercules, CA, USA) at 570 nm. NO production in the culture medium was detected by estimating the NO metabolite, nitrite, based on the Griess reaction as previously described . The production of PGE2, MMP-3 and MMP-13 was measured by human ELISA PGE2, MMP-3 and MMP-13 kits (Sigma) according to the manufacturer’s respective instructions. Total RNA was extracted from chondrocytes using TRIzol reagent (Invitrogen). Four microgram of total RNA for each sample was converted to cDNA by SuperScript reverse transcriptase and then amplified by Platinum Taq polymerase using the SuperScript One-Step RT-PCR kit (Invitrogen). The PCR primers for inducible Nitric Oxide Synthase (iNOS) were 5’-TTTCCAAGACACACTTCACCA-3’ (forward) and 5’- ATCTCCTTTGTTACCGCTTCC-3’ (reverse); for cyclooxygenase-2 (COX-2) were 5’- GAGAGATGTATCCTCCCACAGTCA-3’ (forward) and 5’- GACCAGGCACCAGACCAAAG-3’ (reverse); and for GAPDH were 5’-ATGACAACTCCCTCAAGAT-3’ (forward) and 5’-GATCCACAACGGATACATT-3’ (reverse). Cycling conditions for amplification were: 95°C for 1 min; 40 cycles at 95°C for 45 s, 60°C for 30 s, and 72°C for 30 s; finally, 72°C for 5 min. The relative expression levels were calculated by 2- ΔΔCt method and normalized to the expression of the housekeeping gene GAPDH. Human OA chondrocytes were homogenized and lysed with RIPA lysis buffer (Beyotime Biotechnology, Shanghai, China). Equal amounts of protein (30 μg) were loaded and separated by 12% SDS-PAGE, and transferred onto nitrocellulose membranes (Bio-Rad). After blocking with 5% non-fat milk in Tris-Buffered Saline (TBS) with 0.1% tween-20 (TBST) at room temperature for 1 h, the membranes were incubated with primary antibodies (anti-iNOS, anti-COX2, anti-phospho-NF- κB p65, anti-IκBα and anti-GAPDH) (Santa Cruz Biotechnology, Inc., Santa Cruz, CA, USA) overnight at 4°C. Then, the membranes were incubated with Horseradish Peroxidase (HRP)-conjugated secondary antibodies (Santa Cruz Biotechnology) at room temperature for 1 h. Finally, protein bands on the membrane were visualized using enhanced chemiluminescence reagent (Invitrogen). Experimental values are expressed as mean ± SD. Comparisons between two groups and among multiple groups were conducted using Student t-test and one-way analysis of variance followed by Tukey’s post-hoc test, respectively. Results were considered statistically significant at a P value less than 0.05. To examine the cytotoxicity of PLM on human OA chondrocytes, we performed a cell viability assay. 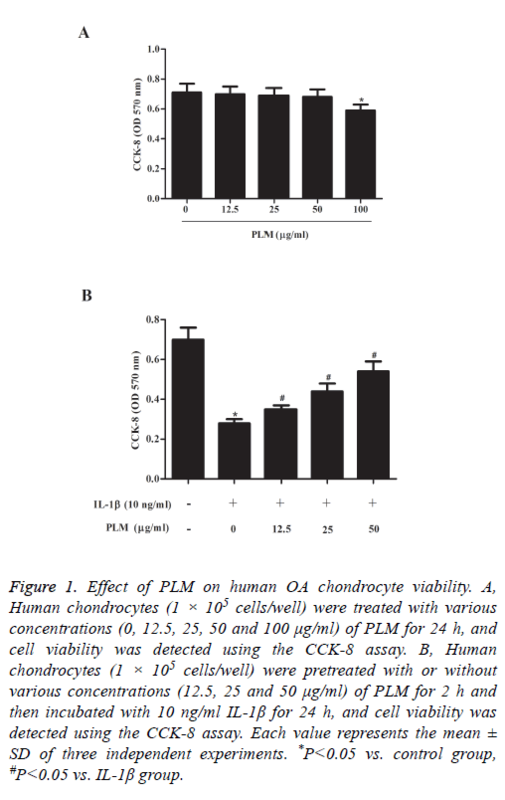 As indicated in Figure 1A, PLM itself did not significantly affect the viability of chondrocytes up to 50 μg/ml. However, at a concentration of 100 μg/ml, a slight decrease in cell viability was observed. Next, we investigated whether PLM treatment could protect chondrocytes from IL-1β-induced cell death. As we expected, the viability of chondrocytes was significantly decreased by IL-1β. At the same time, we observed that pretreatment with PLM effectively reversed IL-1β-inhibited cell viability in a dose-dependent manner (Figure 1B). Figure 1: Effect of PLM on human OA chondrocyte viability. A, Human chondrocytes (1 × 105 cells/well) were treated with various concentrations (0, 12.5, 25, 50 and 100 μg/ml) of PLM for 24 h, and cell viability was detected using the CCK-8 assay. B, Human chondrocytes (1 × 105 cells/well) were pretreated with or without various concentrations (12.5, 25 and 50 μg/ml) of PLM for 2 h and then incubated with 10 ng/ml IL-1β for 24 h, and cell viability was detected using the CCK-8 assay. Each value represents the mean ± SD of three independent experiments. *P<0.05 vs. control group, #P<0.05 vs. IL-1β group. The next experiment was performed to examine the effects of PLM on NO and PGE2 production in IL-1β-stimulated human OA chondrocytes. As shown in Figure 2A, NO production was significantly increased in the IL-1β-treated group when compared with the control group. By contrast, PLM obviously inhibited NO production in a dose-dependent manner. Similarly, pretreatment with PLM also significantly suppressed PGE2 production induced by IL-1β in human OA chondrocytes (Figure 2B). Figure 2: PLM inhibits IL-1β-induced NO and PGE2 production in OA chondrocytes. Human chondrocytes (1 × 105 cells/well) were pretreated with or without various concentrations (12.5, 25 and 50 μg/ml) of PLM for 2 h and then incubated with 10 ng/ml IL-1β for 24 h. A, NO production was detected by the Griess reaction. B, PGE2 production was measured by human ELISA PGE2 kit. Each value represents the mean ± SD of three independent experiments. *P<0.05 vs. control group, #P<0.05 vs. IL-1β group. Then, we investigated the effects of PLM on the expression of iNOS and COX-2 in chondrocytes exposed to IL-1β. The results of qRT-PCR analysis showed that compared to the control group, IL-1β treatment efficiently up-regulated the mRNA expression levels of iNOS and COX-2 in human OA chondrocytes; and these changes were suppressed by PLM (Figure 3A). In line with the results of qRT-PCR analysis, western blot analysis also demonstrated that the elevated protein expression levels of iNOS and COX-2 were reversed by PLM in IL-1β-stimulated chondrocytes (Figure 3B). Figure 3: PLM inhibits IL-1β-induced iNOS and COX-2 expression in OA chondrocytes. Human chondrocytes (1 × 105 cells/well) were pretreated with or without various concentrations (12.5, 25 and 50 μg/ml) of PLM for 2 h and then incubated with 10 ng/ml IL-1β for 24 h. A, The mRNA expression levels of iNOS and COX-2 were evaluated using the qRT-PCR assay. B, The protein expression levels of iNOS and COX-2 were determined by western blot. Each value represents the mean ± SD of three independent experiments. *P<0.05 vs. control group, #P<0.05 vs. IL-1β group. MMPs play an important role in degrading cartilage. Therefore, herein, we investigated the effects of PLM on MMP-3 and MMP-13 production in chondrocytes stimulated by IL-1β. As shown in Figure 4, as compared with the control group, IL-1β stimulation significantly induced the production of MMP-3 and MMP-13 in human OA chondrocytes, which was efficiently prevented by PLM. 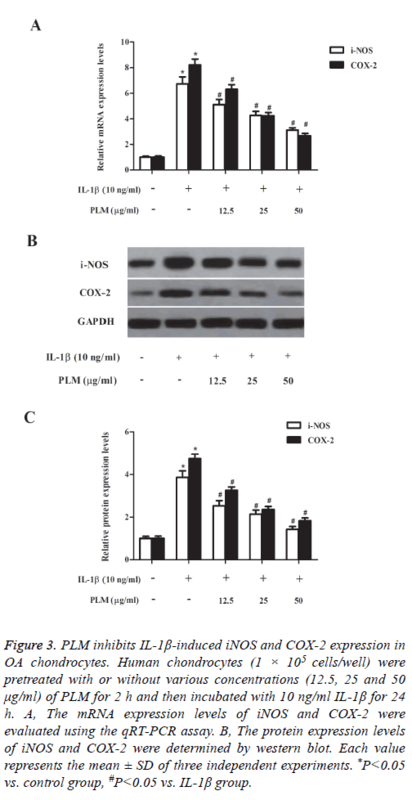 Figure 4: PLM inhibits IL-1β-induced MMP-3 and MMP-13 production in OA chondrocytes. Human chondrocytes (1 × 105 cells/ well) were pretreated with or without various concentrations (12.5, 25 and 50 μg/ml) of PLM for 2 h and then incubated with 10 ng/ml IL-1β for 24 h. A, The production of MMP-3 was measured using the MMP-3 ELISA kit. B, The production of MMP-13 was evaluated by the MMP-13 ELISA kit. Each value represents the mean ± SD of three independent experiments. *P<0.05 vs. control group, #P<0.05 vs. IL-1β group. In order to explore whether the anti-inflammatory mechanism of PLM was associated with the inhibition of NF-κB activation, NF-κB signaling molecules were detected by western blot analysis. As indicated in Figure 5, IL-1β stimulation markedly increased the level of phospho-NF-κB p65, as well as induced IκBα degradation, as compared with the control group. 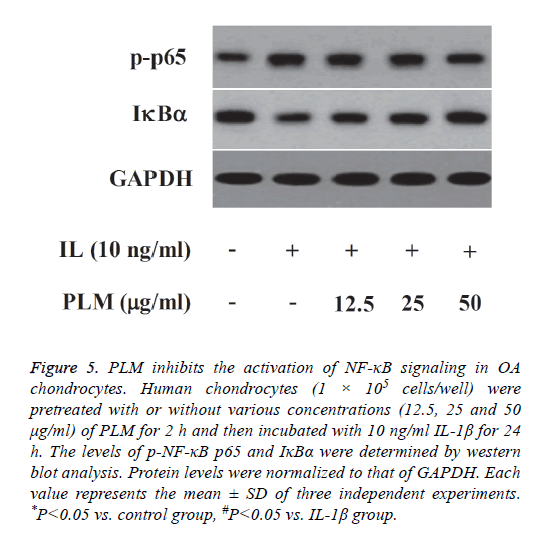 However, PLM greatly inhibited IL-1β- induced NF-κB activation in human OA chondrocytes. Figure 5: PLM inhibits the activation of NF-κB signaling in OA chondrocytes. Human chondrocytes (1 × 105 cells/well) were pretreated with or without various concentrations (12.5, 25 and 50 μg/ml) of PLM for 2 h and then incubated with 10 ng/ml IL-1β for 24 h. The levels of p-NF-κB p65 and IκBα were determined by western blot analysis. Protein levels were normalized to that of GAPDH. Each value represents the mean ± SD of three independent experiments. *P<0.05 vs. control group, #P<0.05 vs. IL-1β group. To our knowledge, this is the first report of the antiinflammatory effects of PLM on human OA chondrocytes. Our results demonstrated that PLM treatment effectively reversed IL-1β-inhibited cell viability in a dose-dependent manner. In addition, PLM significantly inhibited the production of NO and PGE2, iNOS and COX-2 expression, as well as downregulated the production of MMP-3 and MMP-13 in IL-1β- stimulated human OA chondrocytes. Mechanistic studies showed that PLM markedly suppressed IL-1β-induced NF-κB activation in human OA chondrocytes. IL-1β has been widely used to mimic the microenvironment of OA for in vitro studies . Thus, in this study, we used IL-1β- stimulated human OA chondrocytes to examine the antiinflammatory effects of PLM on human OA chondrocytes. The results of this study showed that treatment of chondrocytes with IL-1β significantly decreased cell viability. This observation was consistent with the results of previous studies [14-16]. Additionally, pretreatment with PLM significantly reversed IL-1β-reduced cell viability. These findings suggest that the protective effect of PLM against pro-inflammatory responses induced by IL-1β in human OA chondrocytes. Numerous studies have documented that overproduction of NO and PGE2 contribute to the development of OA [17-19]. NO is produced by iNOS in a variety of types of cells, including chondrocytes . COX-2, known as the rating limiting enzyme, could produce the inflammatory mediator PGE2 in chondrocytes. In addition, IL-1β was found to up-regulate the expression of iNOS and COX-2, which lead to elevated production of NO and PGE2, respectively [21,22]. Besides, PLM has been reported to have anti-inflammatory properties. Lee et al. reported that PLM treatment dramatically inhibited Lipopolysaccharide (LPS)-induced the production of Tumor Necrosis Factor-α (TNF-α) and Interleukin (IL)-6 in Human Umbilical Vein Endothelial Cells (HUVECs) . Consistent with the prior results, our findings showed that PLM inhibited the production of NO and PGE2, and the expression of iNOS and COX-2 in IL-1β-stimulated human OA chondrocytes. The above mentioned results suggest that PLM attenuated the IL-1β-induced chondrocyte injury through down-regulation of iNOS and COX-2 expression. MMPs production and activation have been shown to play a critical role in the progression of OA [24,25]. MMP-13 is expressed mainly by articular chondrocytes, and preferentially cleaves the ECM components, such as type II collagen and aggrecan . Besides, IL-1β is able to stimulate the synthesis of MMPs in chondrocytes . In this study, we found that PLM obviously suppressed IL-1β-induced the production of MMP-3 and MMP-13 in chondrocytes. These data suggest that PLM may exhibit anti-OA effect through suppressing the production of MMPs. Growing evidences showed that NF-κB is an important transcription factor and participates in the development of inflammatory diseases, including OA [28-30]. In response to IL-1β, NF-κB p65 dissociates from IκB and translocates into the nucleus to regulate the expression of inflammation-related genes, including MMP-1, 3, and 13, TNF-α, iNOS/NOS-2, PGE2 and COX-2 . Previous studies indicated that stimulating of chondrocytes by IL-1β could induce NF-κB activation which subsequently regulating the expression of MMPs, COX-2, and iNOS [32,33]. In the present study, we showed that PLM markedly suppressed IL-1β-induced NF-κB activation in human OA chondrocytes. These results imply that the anti-inflammatory action of PLM on IL-1β-stimulated human OA chondrocytes was associated with the suppression of the NF-κB signaling pathway. In conclusion, the results of this study demonstrated that PLM attenuated inflammatory responses in human OA chondrocytes stimulated by IL-1β, possibly through the NF-κB signaling pathway. Thus, PLM may serve as a potential antiinflammatory agent in the treatment of OA. Felson DT. Clinical practice. Osteoarthritis of the knee. N Engl J Med 2006; 354: 841-848. Argoff CE. Recent developments in the treatment of osteoarthritis with NSAIDs. Curr Med Res Opin 2011; 27: 1315-1327. Herndon CM. Topical delivery of nonsteroidal anti-inflammatory drugs for osteoarthritis. J Pain Palliat Care Pharmacother 2012; 26: 18-23. Oh H, Yang S, Park M, Chun JO. Matrix metalloproteinase (MMP) regulates MMPexpression in interleukin‐treated articular chondrocytes. J Cell Biochem 2008; 105: 1443-1450. Ahmad R, Qureshi HY, Mabrouk ME, Sylvester J, Ahmad M, Zafarullah M. Inhibition of interleukin-1-induced MMP-13 expression in human chondrocytes by interferon gramma. Ann Rheum Dis 2007; 66: 782-789. Iwashita M, Oka N, Ohkubo S, Saito M, Nakahata N. Piperlongumine, a constituent of Piper longum L., inhibits rabbit platelet aggregation as a thromboxane A(2) receptor antagonist. Eur J Pharmacol 2007; 570: 38-42. Yang T, Sun S, Wang T, Tong X, Bi J, Wang Y. Piperlonguminine is neuroprotective in experimental rat stroke. Int Immunopharmacol 2014; 23: 447-451. Bezerra DP, Pessoa C, de Moraes MO, Saker-Neto N, Silveira ER, Costa-Lotufo LV. Overview of the therapeutic potential of piplartine (piperlongumine). Eur J Pharm Sci 2013; 48: 453-463. Park MJ, Lee DE, Shim MK, Jang EH, Lee JK, Jeong SY. Piperlongumine inhibits TGF-β-induced epithelial-to-mesenchymal transition by modulating the expression of E-cadherin, Snail1, and Twist1. Eur J Pharmacol 2017; 0014-2999: 30489-30492. Gu SM, Yun J, Son DJ, Kim HY, Nam KT, Kim HD. Piperlongumine attenuates experimental autoimmune encephalomyelitis through inhibition of NF-kappaB activity. Free Radical Biol Med 2017; 103: 133-145. Xiao Y, Shi M, Qiu Q, Huang M, Zeng S, Zou Y. Piperlongumine suppresses dendritic cell maturation by reducing production of reactive oxygen species and has therapeutic potential for rheumatoid arthritis. J Immunol 2016; 196: 4925-4934. Kim SJ, Ju JW, Oh CD, Yoon YM, Song WK, Kim JH. ERK-1/2 and p38 kinase oppositely regulate nitric oxide-induced apoptosis of chondrocytes in association with p53, caspase-3, and differentiation status. J Biol Chem 2002; 277: 1332-1339. Daheshia M, Yao JQ. The interleukin 1beta pathway in the pathogenesis of osteoarthritis. J Rheumatol 2008; 35: 2306-2312. Liao S, Zhou K, Li D, Xie X, Jun F, Wang J. Schisantherin A suppresses interleukin-1β-induced inflammation in human chondrocytes via inhibition of NF-κB and MAPKs activation. Eur J Pharmacol 2016; 780: 65-70. Wang C, Zeng L, Zhang T, Liu J, Wang W. Tenuigenin prevents IL-1β-induced inflammation in human osteoarthritis chondrocytes by suppressing PI3K/AKT/NF-κB signaling pathway. Inflammation 2016; 39: 807-812. Lim H, Kim HP. Matrix metalloproteinase-13 expression in IL-1β-treated chondrocytes by activation of the p38 MAPK/c-Fos/AP-1 and JAK/STAT pathways. Arch Pharmacal Res 2011; 34: 109-117. Abramson SB, Attur M, Amin AR, Clancy R. Nitric oxide and inflammatory mediators in the perpetuation of osteoarthritis. Curr Rheumatol Rep 2001; 3: 535-541. Futani H, Okayama A, Matsui K, Kashiwamura S, Sasaki T, Hada T. Relation between interleukin-18 and PGE2 in synovial fluid of osteoarthritis: a potential therapeutic target of cartilage degradation. J Immunother 2002; 25: 61-64. Li X, Ellman M, Muddasani P, Wang HC, Cs-Szabo G, Wijnen AJV. PGE2 and its cognate ep receptors control human adult articular cartilage homeostasis and are linked to the pathophysiology of osteoarthritis. Arthritis Rheum 2009; 60: 513-523. Abramson SB. Osteoarthritis and nitric oxide. Osteoarth Cartil 2008; 16: 15-20. Ying X, Chen X, Cheng S, Shen Y, Peng L, Xu HZ. Piperine inhibits IL-β induced expression of inflammatory mediators in human osteoarthritis chondrocyte. Int Immunopharmacol 2013; 17: 293-299. Ma Z, Wang Y, Piao T, Liu J. Echinocystic acid inhibits IL-1β-induced COX-2 and iNOS expression in human osteoarthritis chondrocytes. Inflammation 2016; 39: 543-549. Lee W, Yoo H, Kim JA, Lee S, Jee JG, Lee MY. Barrier protective effects of piperlonguminine in LPS-induced inflammation in vitro and in vivo. Food Chem Toxicol 2013; 58: 149. Wang M, Sampson ER, Jin H, Li J, Ke QH, Im HJ. MMP13 is a critical target gene during the progression of osteoarthritis. Arthritis Rese Ther 2013; 15: 1-11. Li J, Nahra J, Johnson R, Bunker A, OBrien P, Yue WS. Metalloproteinase, Osteoarthritis, mmp-13. J Med Chem 2008; 51: 835-841. Vincenti MP, Brinckerhoff CE. Transcriptional regulation of collagenase (MMP-1, MMP-13) genes in arthritis: integration of complex signaling pathways for the recruitment of gene-specific transcription factors. Arthritis Res 2002; 4: 1-8. Kobayashi M, Squires GR, Mousa A, Tanzer M, Zukor DJ, Antoniou J. Role of interleukin-1 and tumor necrosis factor α in matrix degradation of human osteoarthritic cartilage. Arthritis Rheum 2005; 52: 128-135. Saito T, Tanaka S. Molecular mechanisms underlying osteoarthritis development: Notch and NF-κB. Arthritis Res Ther 2017; 19: 94-100. Roman-Blas JA, Jimenez SA. NF-κB as a potential therapeutic target in osteoarthritis and rheumatoid arthritis. Osteoarth Cartil 2006; 14: 839. Chen LX, Lin L, Wang HJ, Wei XL, Fu X, Zhang JY. Suppression of early experimental osteoarthritis by in vivo delivery of the adenoviral vector-mediated NF-kappaBp65-specific siRNA. Osteoarth Cartil 2008; 16: 174-184. Olivotto E, Otero M, Marcu KB, Goldring MB. Review: Pathophysiology of osteoarthritis: canonical NF-κB/IKKβ-dependent and kinase-independent effects of IKKα in cartilage degradation and chondrocyte differentiation. RMD Open 2015; 1: 410-424. Lauder SN, Carty SM, Carpenter CE, Hill RJ, Talamas F, Bondeson J. Interleukin-1beta induced activation of nuclear factor-kappab can be inhibited by novel pharmacological agents in osteoarthritis. Rheumatology 2007; 46: 752-758. Bauge C, Attia J, Leclercq S, Pujol JP, Galera P, Boumediene K. Interleukin‐1β up‐regulation of Smad7 via NF‐κB activation in human chondrocytes. Arthritis Rheum 2008; 58: 221-226.